Take the Nanto City Bus and get off at Toga-Geijutsu-Koen <Toga Art Park> (about an hour). Take the Kaetsunou bus (To Shogawa-Machi or Komaki-Entei) and get off at Inami (about 50 minutes). From Kyu-Inami-Eki take the Nanto City Bus to Toga-Geijutsu-Koen <Toga Art Park> (about an hour). An hour ride by taxi from Toyama Airport. 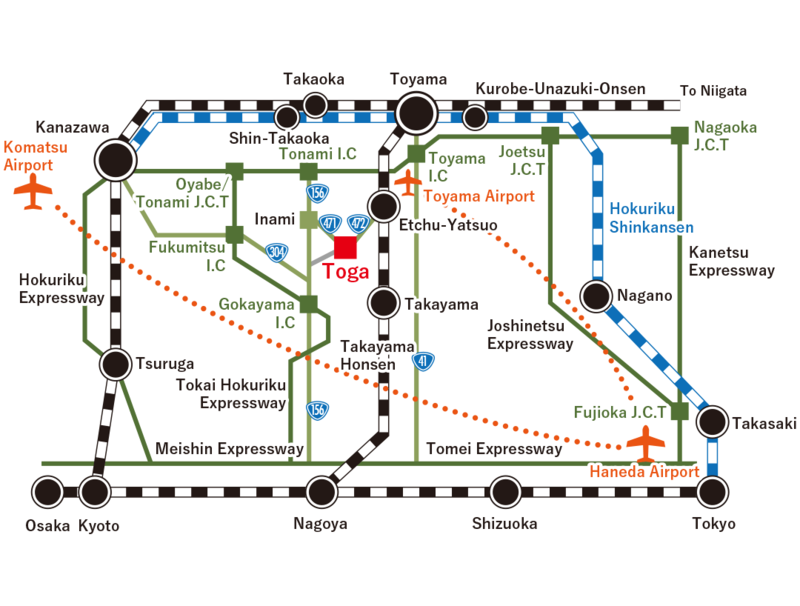 From Toyama Airport, take the airport shuttle bus to Toyama Station (about 30 minutes); then take the JR Takayama Honsen to Etchu-Yatsuo Station. From there, take the Nanto City Bus to Toga-Geijutsu-Koen <Toga Art Park> (about an hour).